This is a nice way to get kids to eat their fruit and veggies! Peel the carrots properly and cut it into small slides. Wash and drain the pineapple slices and cut them into small pieces, mix the chopped pineapple with a carrot. Squeeze the ginger juice onto the carrot and pineapple mixture. Mix Lime juice, soy sauce, salt, pepper and sugar and pour it into the carrot-pineapple mixture and toss well. 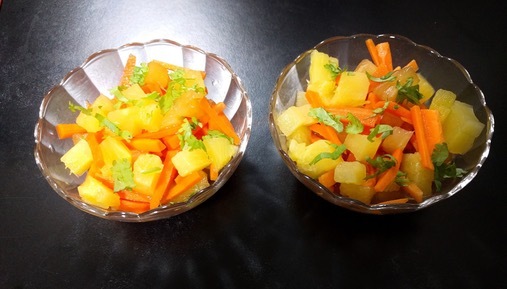 Serve the salad garnished with Coriander leaves.